January is a great time to consider moving into a new office space. Many business owners want to know how they can benefit from new ideas, new business furnishings, and just a fresh new look for their growing companies. So here at 1 Source Office Furniture, we came up with five tips to help you create a new and improved furnished office in 2019. The first step to a successful office makeover is to do some research right in your own company. Choose a few managers or employees (make it democratic but not too cumbersome) and ask them what works and what needs improvement: Is it more storage? Is it more collaboration or an area for team meetings? Is it just about color and style? This information will help guide the process of selecting and buying office furniture that will look and function best in 2019. If the new office build-out and furniture procurement will be a team project, assign clearly what each member will do. Schedule regular meetings and updates that allow the decision process to move forward in a timely manner. The team at 1 Source Office Furniture has nearly four decades of experience in merchandising, specifying and retailing office furniture. That means that we have helped business owners get more than just furniture, they get space planning and consultation time from us also, at no added cost. When selecting an office furniture dealer, make a few inquiries and ask what their overall philosophy is when furnishings businesses: Do they represent mainly one high-end line, such as Haworth TM or Steelcase TM? If so, then you will be presented with high-end lines rather than more middle price-point products. With 1 Source, benching systems begin at around $800 per station. With the high-end lines, that amount can easily triple. 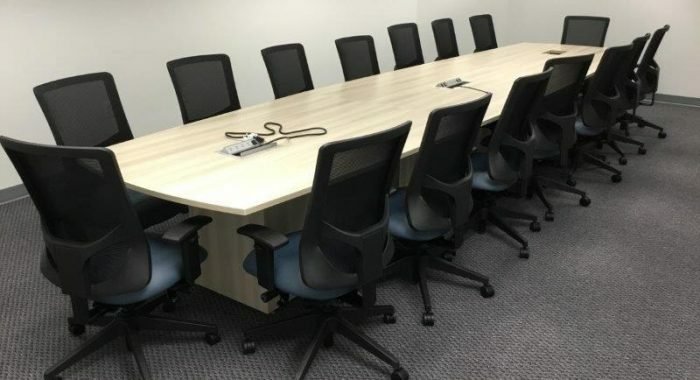 To many office furniture buyers, the differences between these systems is subtle, because they are based on the traditional draw-rod system developed by the high-end manufacturers. (Browse our benching systems by clicking here). 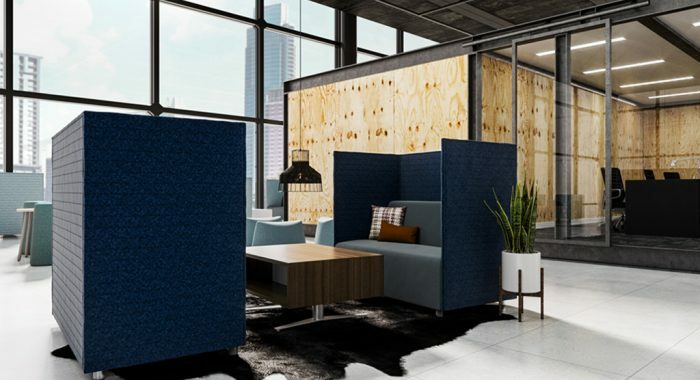 Many owners of growing companies prefer to have two types of work areas within their offices: 1) An open and interactive space furnished with benching or systems furniture; and 2) Private walled-in offices for key executives and others who need privacy. At a transport company, we put sales professionals at 85 spacious benching stations where they can check a board displaying who has the highest sales, ask for a tip from their supervisor, or grab a snack nearby. The biggest consideration with an open office is noise. If noise might pose a problem, then use higher privacy panels or provide headsets for telephone calls. A white noise or noise cancelling system can also mitigate the level of noise. Check with your leasing agent to determine if you can find a space that has both open and private areas for your employees. When planning for a new furnished office in 2019, stay open to change and to a new way of working. The formerly static workspace where everyone has an assigned desk has morphed into employees being able to plug in anywhere for daily tasks, meetings and more. 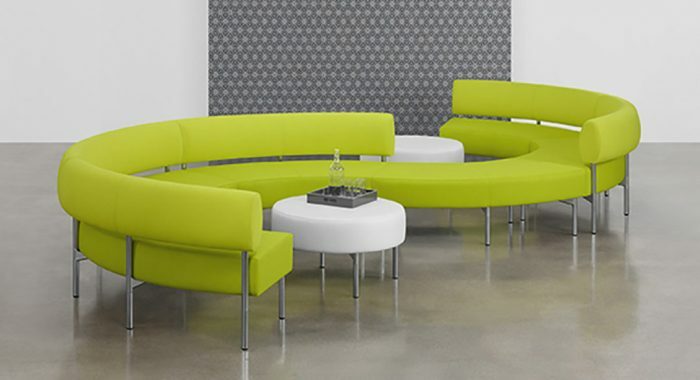 Consider flex areas with lounge seating, or café tables where staffers can gather outside of their assigned space. Look at storage differently. 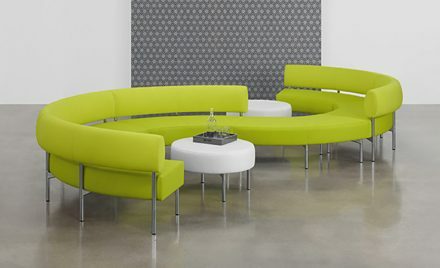 Look at meeting areas that can be multi-functional. It’s so convenient to transform a conference room when it’s furnished with stowable training tables and stacking chairs. Make sure your plan appeals to employees of all ages so that you can keep them happy, and you can attract the best and brightest people to join the team. 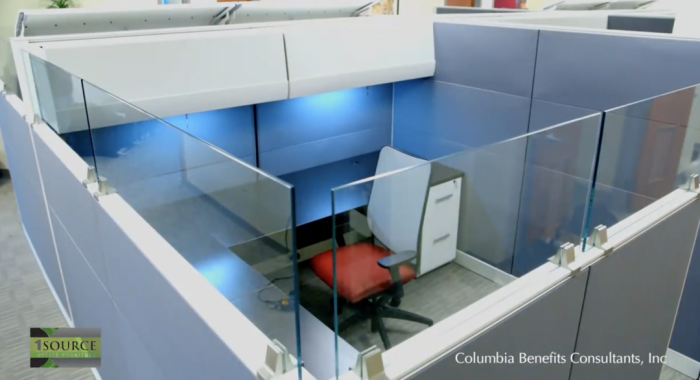 If you are like most office furniture consumers, you want to see how the new furnishings will look in the space before you accept the proposal. 1 Source provides floor plans and two- or three-dimensional drawings of workstations so that clients can see exactly how the systems will look. At this point, clients can check the size of the work surfaces, aisles and entry points, the placement of power, panel heights, and more. To see all of your choices together, make a board with samples of the work surface, panel fabrics and trim color, chair fabrics, and anything else that will go in the new office. Look at everything with the wall paint and floor covering selection to make sure they all coordinate. 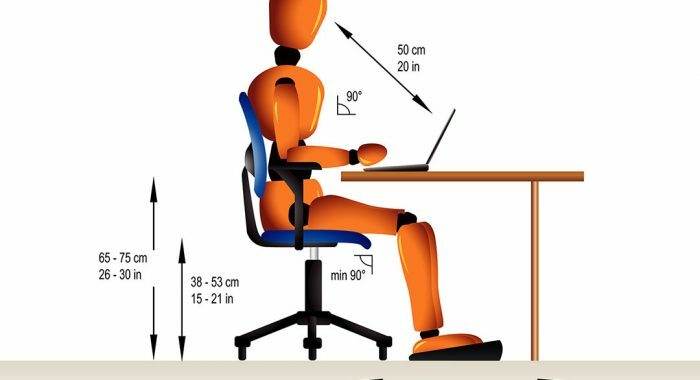 The team at 1 Source Office Furniture can help with this important step in the success of your new office plan. In addition, furniture clients can add splashes of color to keep the new space energetic and vibrant. See some of the outstanding commercial textiles offered by Momentum. Use your company’s logo colors and branding in the reception area and throughout the space. Try a neon color somewhere in the design. At 1 Source, we love using bright colors (sapphire, lime, scarlet, etc.) for tack boards on benching systems because they eye is drawn to that area and there is just a moderate amount of it. 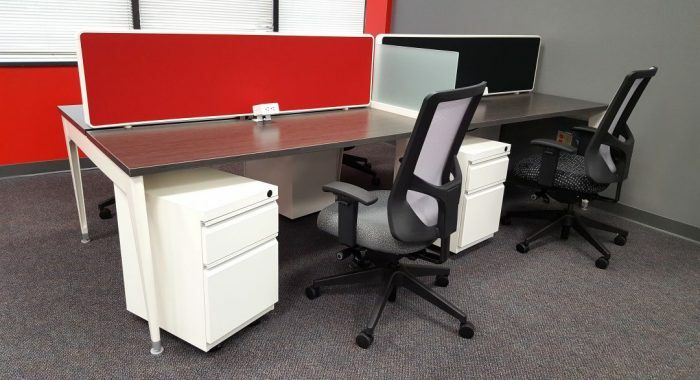 Even though there are so many choices available to office owners, your office furniture dealer will help narrow it down to the best options for your new furnished office space in 2019. Ask us how by calling us at (410) 978-6500 or visiting the contact page on our site and filling out our form. You’ll be glad you did!